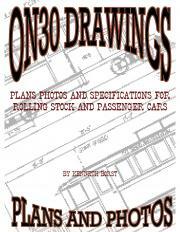 This is a book loaded with plans in quarter inch scale for 30" gauge rolling stock and passenger cars. It is 48 pages of drawings and assembley photos for over one dozen cars. A delight for those that like to make thier own trains. Included in a seperate booklet is a selection of structures to fit 30" gauge. there are over a dozen pages of quarter inch scale drawings for a station, houses, maintanence structures and businesses for your railroad. You can get this in either PDF format or hard copy. This book is to be ordered direct from the author by email. PDF format by e-mail is $10.00 US funds. Hard copy is $30.oo US funds for both sections. You can order by e-mailing direct to krborst@hotmail.com. Order will be sent on reciept of funds. All prices are post paid .